By offering the taste of sweetness without any calories, artificial sweeteners seem like they could be one answer to effective weight loss. The average 12-ounce can of sugar-sweetened soda delivers about 150 calories, almost all of them from sugar. The same amount of diet soda—zero calories. The choice seems like a no-brainer. “While they are not magic bullets, smart use of non-nutritive sweeteners could help you reduce added sugars in your diet, therefore lowering the number of calories you eat. Reducing calories could help you attain and maintain a healthy body weight, and thereby lower your risk of heart disease and diabetes,” said Dr. Christopher Gardner, an associate professor of medicine at Stanford University in California, in a press release accompanying the scientific statement. As with everything, there’s more to the artificial sweetener story than their effect on weight. To learn more about them, I spoke with Dr. David Ludwig, an obesity and weight-loss specialist at Harvard-affiliated Boston Children’s Hospital. 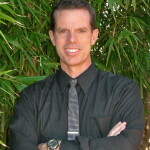 He has a keen interest in products designed to help people lose weight at keep it off. And what he has learned about artificial sweeteners worries him. 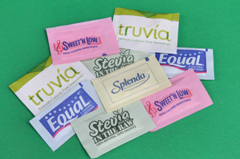 The FDA has approved five artificial sweeteners: saccharin, acesulfame, aspartame, neotame, and sucralose. It has also approved one natural low-calorie sweetener, stevia. How the human body and brain respond to these sweeteners is very complex. It’s also possible that these products change the way we taste food. “Non-nutritive sweeteners are far more potent than table sugar and high-fructose corn syrup. A miniscule amount produces a sweet taste comparable to that of sugar, without comparable calories. Overstimulation of sugar receptors from frequent use of these hyper-intense sweeteners may limit tolerance for more complex tastes,” explains Dr. Ludwig. That means people who routinely use artificial sweeteners may start to find less intensely sweet foods, such as fruit, less appealing and unsweet foods, such as vegetables, downright unpalatable. Artificial sweeteners may play another trick, too. Research suggests that they may prevent us from associating sweetness with caloric intake. As a result, we may crave more sweets, tend to choose sweet food over nutritious food, and gain weight. Participants in the San Antonio Heart Study who drank more than 21 diet drinks per week were twice as likely to become overweight or obese as people who didn’t drink diet soda. But you say you can give up diet drinks whenever you want? Don’t be so sure. Animal studies suggest that artificial sweeteners may be addictive. In studies of rats who were exposed to cocaine, then given a choice between intravenous cocaine or oral saccharine, most chose saccharin. What’s your definition of safe? Whether non-nutritive sweeteners are safe depends on your definition of safe. Studies leading to FDA approval have ruled out cancer risk, for the most part. However, those studies were done using far smaller amounts of diet soda than the 24 ounces a day consumed by many people who drink diet soda. We really don’t know what effect large amounts of these chemicals will have over many years. And there are other health concerns beside cancer. In the Multiethnic Study of Atherosclerosis, daily consumption of diet drinks was associated with a 36% greater risk for metabolic syndrome and a 67% increased risk for type 2 diabetes. Aren’t these diseases that artificial sweeteners may help prevent in the first place? Maybe sugar isn’t too bad after all. It’s all in how it’s packaged. I think I’ll have a glass of water and an apple. My grandfather died of alzheimer’s disease at the age of 50. He used saccharin in every glass of tea he drank and he had it 3 to 4 times a day. The doctor told my family that he thought the disease was due to the saccharin. What are your thoughts? I was a small child, he died in the late 80’s. Artificial sweeteners used to flavor food and pleasing to basically are suitable for people with diabetes and people who are in weight control. There are many artificial sweeteners such as aspartame and saccharin. One problem with sugars is that many products add an extremely high amount of sugar to sweetener the products. More intake means more calories , and more calories means illness and effects your health. they contribute to more illnesses than any benefit. One problem with sugars, however, is that many products add an extremely high amount of sugar to sweetener the products. This, in turn, causes the product to be higher in calories. Because consuming more calories means you must expend more calories to reduce or manage your weight, this can be of concern. I have always used artificial sweeteners. Until, I read the book “Knockout” by Suzanne Somers. Artificial sweeteners contain harmful substances that trick our bodies. But, cancer seems to love sugar. According to the article, brown raw sugar is the same as white sugar. But how does raw brown sugar become white sugar; they chemically bleach color forming impurities into colorless ones and the process is called “Mill White” and is clarified with phosphoric acid and calcium hydroxide which combine to calcium phosphate. Just how much bleach do we want to consume. Now thankfully we have stevia products which is approved by the FDA and can replace sugar naturally. Soon it will replace sugar in diet soft drinks and will help all of those addicted to colas etc. Let’s all remember to eat healthy and eat lots of fruit, vegetables, milk/dairy just like the food color chart so we won’t still be hungry and crave sweets loaded with sugars. Artificial sweeteners or energy used to flavor food and pleasing to basically are suitable for people with diabetes and people who are in weight control. For a person who play sports are not recommended frequent consumption of this product because in the sportsman the main feature of their diet is increased energy for physical activity and if not indicated any sweetener would cover that feature. However, there are some cases in which you can specify the use such as sports where weight is crucial to competition as in Competitive Art (synchronized swimming, rhythmic gymnastics, etc. or contact sports. The recommendation for the daily intake depends on the product and the pounds of body weight that the individual has. For human consumption are permitted three artificial sweeteners such as acesulfame K, aspartame and saccharin. IT’s funny because I had been using sweeteners in my coffee and tea for over 20 years and thought they were doing me good, but after some research I found that they are counter-productive for weight loss. If you take the low carb diet for example, and use sweeteners, you will get a craving for sweet things much more often than usual, and we all know cravings are the curse of anyone watching their weight. I think sugar is the better option if you MUST have a sweet tea, but cut it out all together…it may take you a month or so to get used to the non-sweet taste, but it will be worth it in the long run. Thanks for the article, it underlined what I have thought about artificial sweeteners for a few years. I have heard many things about artificial sweeteners not being good for your health. I know sugar in excess can be bad for you as well. My advice would be to use both in moderation. There’s alot of harmful effects on the body with artificial sweetners for sure. It’s a violation of sound nutrition principles. More and more people are catching on now though, thank goodness! Reading many of the posts before me, the consensus seems clear – natural is better than artificial. It sounds like an easy enough conclusion to come to but when we’re talking about weight control and dieting, the picture often becomes blurred with people’s need for sweetness and the automatic assumption that sugar is bad. Its the whole “have your cake and eat it too” syndrome for many dieters. Moderation is the key to any healthy lifestyle be it with natural sugars or artificial sweeteners and too much of anything is unhealthy, plain and simple. I have patients who visit my office on a regular basis who get headaches from these artificial sweatners. I also tell my patients to avoid when possible and use unprocessed sugar in moderation instead. I also dont believe using suger is that bad for you. As long as everything is used in moderation and a person is actively exercising, everthing should be fine. The profit margins on artificial sweeteners are extremely high for the manufacturers, they still cost the food industry just a fraction of the cost of sugar and corn syrup. Corn syrup was introduced by the industry as a low-cost alternative to sugar. So it’ is not surprising that the food industry is promoting its “diet” or “light” products heavily, thus moving the customers over to its more profitable, artificially sweetened products. individuals use sugar substitutes- For Diabetes people have difficulty to regulating their blood sugar levels. By limiting their sugar intake with artificial sweeteners, they can enjoy a varied diet while closely controlling their sugar intake. I am really agree that “Artificial sweeteners may seem like a healthy alternative to regular sugar, but as this post points out, the risk may be greater than the benefit”. Sugar is the main cause for over weighting. Thank you for a great post. As of late I’ve read more and more about that dangers of sugar and use of artificial sweeteners to help reduce those risks. Personally, I’m not a fan of anything artificial for nutrition. And the fact that there just hasn’t been enough long term testing of these sweeteners continue to drive my caution in using them as well. Dr. Ludwig’s comments add even more thoughts to consider in using these substances. Thank you again for this information. I am adding it to my knowledge bank to use in my efforts to help individuals participate in a healthy lifestyle when it comes to their nutrition. You have to wonder about these sweetners. I think there are some sweeteners that are actually worse than others, but I don’t think ALL sweeteners that aren’t made from sugar are bad. Yes, sugar is the ingredient our body uses, but it doesn’t always rule out natural alternatives like Stevia. It’s when you’re getting TOO MUCH of anything it becomes a problem. My husband and I have a membership at YMCA, I don’t intake any soda. I do use Artificial sweeteners in my coffee ( no more than 2 cups in the morning) we use Artificial sweeteners in all baking and by eating right and exercising and watching our diet, I feel MUCH BETTER than in taking regular sugar. 1 Thing, My husband as a treat has his cookies and I have my almonds. We swim, speed walk and use certain weights. I also do crunches and use machine for love handles, We drink LOTS of WATER. Happy in Oklahoma! Nature is the best. Taking the natural sugar can benefit your health as long as you take attention on what you are eating. Never over-consuming. About 5 years ago, I became extremely sick, prompting me to go see a doctor. The symptoms were fatigue, pain in my left side, extreme thrust, shortness of breath, unable to sleep due to pain in left side, muscle weakness, dizziness, lack of appetite, weight loss, and anxiety. After performing tests, the doctor told me I had pneumonia with fluid build up in my left lung. She also said I had 6000 triglycerides….the most she had ever seen in her entire life as a doctor. And….to top it all, she also diagnosed me as being diabetic with a sugar count of 640. This was very distressing news, since I had always been in very good health, and very rarely ever needed a doctor due to illness. She immediately gave me a shot to lower my sugar count, and pneumonia, and prescribed insulin shots, along with “Lipitor” tablets to also lower my cholesterol. Now, my being concerned as to what caused all this mess, I immediately cut out all foods with artificial content, such as artificial sweeteners, chemical additives such as MSG, sodas, and especially oils. And, oh yes….I tried walking a few miles a day. Just about a month later, all my vital signs reverted back to normal, which mystified my doctor, and most of the staff in the clinic. My doctor also took me off of insulin, and put me on pills, which worked very well up to now. Just recently, I tried going off the pills, and substituted them with an over the counter vitamin supplement called “Alpha Lipoic Acid” 600 MG tablets, which I take twice a day. It has worked wonders, for the past 4 months regulating my blood to normal without the prescriptions, and I am feeling great. I agree, this article needs re-defining. Stevia is a natural sweetening made from a plant and not synthetic. We use it in baking, coffee, and things such as this. We also have our own honey bee hives and process it without heat so it is very healthy and use it often for sweetening even in baking where ever it calls for sugar. It is very healthy for a person. i find it interesting you categorize stevia with the other artificial sweeteners. stevia leaf is NOT chemically derived like the others. also, stevia is NOT poisonous like the others. you should have warned people about sugar (fructose from gmo sugar beets) to cane sugar (even if it is refined it is better than fructose in any form). how deceptive this article is, stevia doesn’t harm you in that way and if used properly, doesn’t fool the body nor the mind. truvia IS NOT stevia. I have studied aspartame (NutraSweet, Equal) for more than 25 years because it caused a drastic personality change and intellectual deterioration in my daughter. She also developed epileptic-type seizures and began to lose the vision in both eyes. artificial sweetener in diet soda. He has written many medical texts about aspartame. 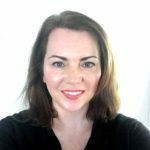 She finally stopped drinking sodas containing aspartame, and she had a complete recovery and has had a fine job since then as a computer programmer and financial analyst and actuary. My daughter drank only one can of diet soda a day. I react with a classic migraine after a few sips of diet soda. Aspartame causes many serious documented problems in so many people. The FDA should REMOVE IT FROM THE MARKET! Surely it is a case of moderation, in the case of weight loss even too much in the way of natural sugars (and not enough exercise) has been reported to add weight. I try and go by the old saying ‘everything in moderation’ but even then I am unsure of what exactly is moderation?! I stopped drinking any diet soda since Jan 1st and have kept it going strong. I now just drink water with occasional unsweetened tea for meals. I use Splenda to sweeten it up. I would suggest to stay away from any soda whether diet or sweetened. You will see the loss of weight and a better and healthier body if you do !! Whole fruits contain natural sugars and have redeeming qualities like fiber and vitamins. Dear Robert, Splenda isn’t any better as it is STILL a chemical. It would be better to try something NATURAL – stevia, xylitol, maple syrup, but try to avoid ALL chemical sweeteners. It’s interesting how strong stand Harvard takes in the case of non-nutritive sweeteners. As Harvard professor Mozaffarian has many times pointed out animal and cohort studies are only suggestive. Artificial sweeteners are not natural which means there are chemicals involved that might affect our body. There is even a study that these sweeteners can make you fat and affects your diet in a negative way. I suggest to use natural cane “brown sugar” than the white one. Mike — Chemically, there isn’t any difference between “natural cane brown sugar” and white sugar. You may be getting peace of mind from the switch, but it isn’t doing anything for your body. Sadly you could be right. Sometimes it is easier to colour sugar than than use a product not completely purified which may vary too much. Not sure if this practice is current and molasses or the raw sugar is not always easy to get hold of. People seem to be able to add salt to their taste why not for sugar? Adulturating food seems to be a tradition impossible to stop. Some years ago I read a report saying that the sweet taste in your mouth of an artificially sweetened food or drink stimulates the production of insulin in the body. But because there is no sugar to be metabolized, the body is left with excess insulin. Over time, the regular production of insulin that’s not used causes difficulties that could be compared to diabetes – although not the same. Since then, I’ve heard nothing about this. Why? was it proved to be wrong? Have there been further studies? Does anyone know? Hi A very good thought. The body recognises in the west only four tastes and there are probably more regulatory controls in us than we realise. We know if we need food. We know if we need a drink. We keep our body temperature within very close limits etc. etc. It is intuitive that a SWEET taste will make us react in some way such as to get rid of the sugar. Those that cannot then adapt to the new situation (no sugar to get rid of) are likely to suffer. The body will learn to cope EVENTUALLY but as you say many will get false diagnoses of DIABETES from substiute sugars? And a few years ago this meant possibly a new wonder drug for diabetes that turned my friends diabetes to a death sentence from bowel cancer in two years. The new wonder drug has been removed because it is thought but not likely to produce bowel cancer. We seem as positive over drugs that give us cancer as we are about sugar substitutes that may give us epilepsy etc etc. Mercury that well known brain destroyer is almost certainly not the cause of disordered brains in babies injected with thimerosal a well known compound of mercury. So that leaves it open to discuss anything else MORE likely. At present coffee or going to work every day are the most likely causes for the massive rises in autism. UNLESS you know better? I gained weight and became morbidly obese drinking regular soda. Starting at the age of 46, I lost 150 pounds of body fat — all the time drinking diet soda. I know skinny people who only drink diet soda and I know obese people who drink only regular soda. Most overweight people drink diet soda because they want to cut down on calories – they do know and understand more calories equals weight gain. Unfortunately many clinicians wrongly associate statistical data to a disassociated problem. For example, an extremely large percentage of people who have cancer eat vegetables. Weight loss has vastly more to do with energy balance than drinking diet soda or eating any certain type of food. Steve—Spoken like a trainer…but oh so right! I have a grown daughter who works from home; sits all day long, and never walks a step where she doesn’t have to. This poor child got to TV before she was even 2 years old! And (how ironic is THIS) she would watch me doing exercises on the Jack LaLanne Show, and she would (when I asked her to) “Do like Mommy”) go back to playing with her one-year-old sister. One truly creative Dr suggested that I was “sleep-snacking”! “On WHAT?” I burst out, “I don’t keep snacks in the house, I have to COOK EVERYTHING!” “Well,” he allowed uncomfortably, “how about leftovers”? It was then that I knew that there was truly no help out there. Later on I learned that my problem (and probably so many others who had the same problem in the 60s & 70s), was irregular estrogen releases from our ovaries. Seems childbirth screws EVERYTHING up in a lot of women, especially that! This same doctor has raised her thyroid hormone to 120mcg. She DOES look slimmer but she assures me that she “hasn’t lost any weight”. She probably hasn’t “lost weight”. She HAS lost fat, though, it shows in her clothes. Why she hasn’t ‘lost weight’ is possibly because she’s eating stuff she might be allergic to. She absolutely needs to get out of the house more, on her feet. She already has to walk with a cane because due to her inactivity her bones are literally disintegrating. I gave her Citrical and D3, but it hurts my heart to realize that this poor thing is walking with a cane at only age 53! And I’ll be 74 this year and I walk every chance I get! Anyway. Do you think that there was maybe an underlying condition even back when she was 2, that caused her to prefer sitting to standing and walking and running around? The doctors all said what they always say (and it never seems to happen) “She’ll outgrow it”, I was earnestly told. Well. Now she’s working from home and her husband really ‘cracks the whip’. She allowed that she’d like to retire from her job but he said that the family couldn’t afford for her to retire. She’s paying for a home, she has 2 beautiful kids, she pays for them, one of them got a scholarship to TCU and is now teaching German for the summer at the U of New Mexico—the husband goes to work at night and comes home in the morning. He’s a head case—he refused to take the SSRI that his Doctor advised him to take because “I don’t feel like myself when I take that stuff” (Wellbutrin). I always cultivated a good relationship with all my inlaws. But this guy’s scary. He collects guns, because on his salary he can afford them since my daughter pays for everything. Recently he was worried that the Affordable Care Act wouldn’t care for him as well as my daughter’s insurance—which SHE has to pay for! and ALL BECAUSE OF A LACK OF EXERCISE! Oh yeah—her husband won’t even take her out for a walk. Can’t be bothered, I suppose. I’d take her myself but I live 50 miles from her and the gas is prohibitive. I find it interesting that there seems to be a new sugar substitute released about every two years, and as you’ve mentioned it does seem to skew the way you interpret taste, as I find myself drawn to splenda rather than any other sweetener, real or artificial. I do make it a point to have some natural sugar everyday, my personal preference is a fruit smoothie, and believe a lot of people could benefit from having their bodies digest more natural sugars. I would like to see someone, hint hint, do a study/article on high fructose corn syrup, sugar, and artificial sweeteners. Really demystify them as it seems as though they have all been run through a political smear campaign. Sugar = diabetes; artificial sweeteners = cancer; high fructose corn syrup = obesity. I almost feel like I should be dropping two cubes of pineapple in my morning tea, unless I want to end an obese diabetic with cancer! I personally prefer sugar over sweeteners because I find it safer besides I am not addicted to sweets so I think i am fine. Numerous controlled trials have shown that consuming non-nutritive sweeteners can lead to weight loss; one showed it worked better than drinking water. However in the real world, people do sometimes choose a diet soda precisely so that they can use those calories later in the day for a dessert. This is called reverse causality by researchers, but I’d call it good planning. Often the association between overweight and consumption of diet soda is because those wishing to lose weight start drinking non-caloric beverages. That might mess up a study, but as a dietitian I think it is a good idea. the studies that show a relationship between artificial sweeteners and chronic disease are observational and show weak associations at best – not a cause and effect relationships. also, the increase risk you quote is relative risk – not absolute risk. You should always show absolute risk which gives the reader a much more realistic (and usually much lower) view of the possible risk. Although I agree with Beth Kitchin that you should give the absolute risk values as well (questions on operationalisation might arise here as well, but that’s another issue), I believe showing these correlations can be indicative of a relationship. Whether that’s indicative of a causal relationship is a completely different matter. If you stop eating anything with animal fats, which would be to become a vegetarian, and then only eat organically grown vegetables, you MIGHT extend your life and/or prevent some ailments, though things will still happen due to aging. And then, after doing all of these healthy things, along with exercise, a lot of rest, etc., etc., YOU DIE! The best advice is to be somewhat moderate in things you do, don’t overeat, but do not restrict yourself to all the joys of life by being a diet nut, etc. Remember that there are some that live relatively unhealthy lives and live a long time, while there are others that live picture perfect so-called healthy lives that die off young. Genetics play a huge part regardless of choice of life styles. I am a bit of a diet nut. At home, I eat mostly fruit, vegetables, nuts, whole grains, and wild salmon. (When I go out I relax somewhat.) I also run more than 1,000 miles annually and get my sleep. My goal is to stay as healthy and fit as possible for as long as possible. I’ve seen the ravages of stroke, and aging generally, and I hope to avoid the first and slow the second. I’m so far doing well–the doc was extremely surprised by how well I performed on a stress test, at age 57. I realize I’m playing the odds, and that a meteor, a truck, or some disease could take me out. If that should happen, I’m not going to regret my choice. Good luck to you David! It’s hard for most to follow a regimen like you do. But, don’t forget, that family history and genetics, play in my opinion, the major role in aging and health, and we cannot change this. The use of low-calorie sweeteners has been well studied both in humans and in animals. Such research includes evaluations of any possible long-term effects of use. Before approving the currently available low-calorie sweeteners, regulatory bodies world-wide determined that the low-calorie sweeteners are safe for all populations. Further, leading health groups such as the American Heart Association, Academy of Nutrition and Dietetics and American Diabetes Association support the safe use of low-calorie sweeteners. 1. The Academy of Nutrition and Dietetics. Position of the Academy of Nutrition and Dietetics: Use of Nutritive and Nonnutritive Sweeteners. Journal of the Academy of Nutrition and Dietetics. 2012;112:739-758. 2. Sigman-Grant M, Hsieh G. Reported use of Reduced-sugar foods and beverages reflect high-quality diets. J of Food Science. 2005:70. 3. Alternative Sweeteners; Edited by Lyn O’Brien Nabors; 4th edition; 2012. Absolutely excellent summery of the facts. – Well done. How many dead and ill people does it take to make people realise that ASPARTAME is NOT safe for all? The very OBLIGATORY label to warn people who may suffer SERIOUS harm from ASPARTAME is all very fine for those who KNOW but for many they just DONT KNOW. See case of Miss METZLER above. A small point and errors are easily committed but in SUMMARY why do we put milligram amounts as a maximum for ASPARTAME? This makes it APPEAR more TOXIC than most POISONS! Oh please – there are tons of “Registered Dieticians” on here working for corporate masters like Coca Cola. I wouldn’t take any of these “dieticians” words for it as they are simply paid to spread disinformation to the public. FACT – artificial sweeteners are CHEMICALS..nothing more and nothing less. If you LIKE ingesting chemicals (personally I prefer NATURE) than go for it. It’s improtant to eat our food in th emost natural stste, and artifical sweetners are anything but natural. That being said, I do eat sugar. I use agave necatr almost every day to sweeten plain Greek yogurt. I agree that natural foods where possible are the best bet as our bodies are not designed to take in artificial substances. Having said that it is easier said than done sometimes, I spend most of my time reading packets when I go grocery shopping nowadays! High glucose levels in the system also increases the appearance of aging so refined sugar is a no no too. Artificial sweeteners may seem like a healthy alternative to regular sugar, but as this post points out, the risk may be greater than the benefit. There is no point in being a little healthy by using fake sugar if there’s a greater risk to your health in the long run. We know the importance of using healthcare products that are beneficial to your health, and artificial sweeteners do not fall in that category.